A relatively new but kind of ugly cruise terminal of Acapulco has been built in the downtown area across from the Zocalo (Town Square). Most of the "action" is located at Playa Condesa on the Zona Dorado (Golden Zone), east of the terminal. One of the plentiful VW Bug taxis can get you there for about $3US. From the cruise terminal, many passengers stroll along the downtown Malecon, the waterfront promenade which winds along the bay to the cute little beach of Playa Tlacopanocha. The airport is approximate. 15 miles SE of the center of Acapulco, take a (shared) taxi. 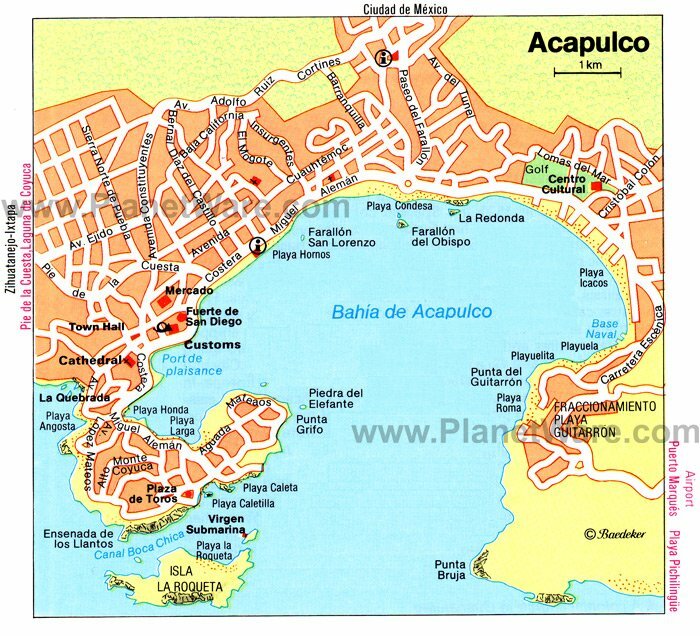 The name "Acapulco" comes from Nahuatl language Aca-pol-co, and means "where the reeds were destroyed or washed away". Acapulco has a reputation. That reputation portrays a city that never sleeps and Acapulco does it’s best to live up to that reputation. Nightclubs and discos don’t close until every last reveler has gone home, at times this is long after the sun has come up. Legendary nightlife aside, Acapulco also has a reputation of being a magnet for the rich and famous. Many celebrities, from all over the world, have homes or keep vacation retreats in Acapulco. Keep your eyes open, as you never know whom you will see in this lively city. Acapulco is a diverse city that offers the many benefits of a large city with a population of over 2 million, yet in many areas of the city, Acapulco retains the feeling of a small town. La Quebrada Cliff Divers - No visit to Acapulco is complete without watching the cliff divers perform their impressive jumps into the shallow stream of water of dangerous tides that forms in the bottom part of La Quebrada. They have been doing it since 1934. You can see the dives from a small platform by the cliff for a small entrance fee, or eat at the La Perla restaurant which offers a good view of the divers. Show time at 1 PM, 7:30 PM, 8:30 PM and 9:30 PM. Zócalo - Zócalo, Acapulco's town square, lies on the western side of La Costera. It tends to expose more local culture than other, more tourist-centric, areas. Zócalo contains Acapulco's cathedral, as well as many restaurants ranging in size from sidewalk bistros and tiny street-corner kitchens. Many of the smaller restaurants will provide full dinners for as little as 35 pesos. Xtasea is Acapulco’s latest attraction and it has one mission: to fulfilling adrenaline thirsty people by letting them fly over the sea in the world’s longest zip line. Acapulco is a city that gives you many choices when it comes to beaches. During the day, most of the focus in Acapulco is on the beach. The theme in Acapulco seems to be Party All Night and Play on the Beach All Day. There are about as many VW taxis in the city as there are other cars, and you can get one on the main street (La Costera) at any hour of the day or night. Always agree on the price before entering the taxi because the driver will almost always try to charge you more if you are a gringo. For most trips during the daytime, you should pay 25 pesos (US$2.25). There's a public bus that runs the length of the strip for just a few dollars. Look for the blue and white buses with the words "Costera" on the side. The rides are quite bumpy, hot, and can get a little crowded - try to get a seat away from the sun. Artisans' Mall: An open-air mall located across from Plaza Bahia, you can find many inexpensive arts and crafts and souvenirs strolling through the many aisles. You will have to test your bargaining skills here because the prices are not posted (and even if they were, you should still bargain). I'm no expert, but one common strategy is to start at 1/3 of the asking price. . . another strategy is to end at 1/3. Basically, it seems to me that arts & crafts seem to go for about half of what they would in the US, Canada, or Europe. Zocalo: This is the older part of the city of Acapulco (not a mall). If you walk around enough, you will find hundreds of shops selling all kinds of gifts, crafts, jewelry, clothing, and just about anything else you can imagine. It's best to shop here during the daytime. The currency of Mexico is the peso (MXN). The symbol for pesos is the same as for US dollars, which can be slightly confusing. Prices in dollars (in tourist areas) are labeled "US$" or sport an S with a double stroke. There are about 17 pesos to 1US$. Several Starbucks and other WiFi cafes around.